A study was released recently that got a lot of media attention along with some critical reviews. According to the study's authors, bad road conditions contributed to 52.7% of fatal collisions in the US. This report is a rare case faulting road construction as a factor. Most studies since 1979 have placed the blame for traffic collisions squarely on the driver either through driver error or inattention. Many of the nation's highways are doubtless in bad shape and the state of bridges and overpasses is downright scary. There is no doubt that we need more and better roads to relieve the traffic burden; especially in large cities. However widening roads, adding more signs and clearer lane markers may not be the best answer. There have been some articles claiming that widening roads and painting clearer markings will lead to the "Peltzman Effect". Sam Peltzman, a professor of Economics at the University of Chicago theorized that people tend to respond to safety regulations or safety technology by engaging in more dangerous behavior. He felt that people adjust their behavior to a regulation in ways that counteract the intended effect of the regulation. One study that found the Peltzman Effect to be true looked at increased safety technology in NASCAR race cars. This study found that safer cars and improved restraint devices have led to riskier behavior on the part of the race car drivers and an increase in collisions on the speedway. The Insurance Institute for Highway Safety (IIHS), in looking at new technology to make cars safer, warned that systems designed to keep a car from automatically straying from the lane or from coming too close to a vehicle ahead are great in theory but they feel it will give drivers a false sense of security leading them to take their eyes off the road more often or allowing them to become more distracted. One wag went so far as to jokingly suggest, if you take the Peltzman Effect to its extreme, cars should be made of cardboard and have a large pointed spike in the center of the steering wheel pointed at the driver's chest. That would force drivers to drive more safely. The intended effect of building wider, clearer roads is to improve the flow of traffic and to cut down on injuries and deaths due to collisions. The Peltzman Effect however says that, as roads are improved, drivers feel they can take greater risks and the average speed on the roadway increases. As a result, the intended effect of making the road safer is offset by riskier driving behavior and the rate of collisions is basically unchanged. As a reaction to this, traffic engineers in cities around the world have moved to a European innovation known as "Traffic Calming". Traffic calming involves the use of restricted lanes, speed bumps, barriers, and warning signs painted directly onto the road surface in an attempt to slow or calm the traffic down. Probably the best and most visible examples of traffic calming procedures are the traffic circles that are replacing traditional four-way intersections. 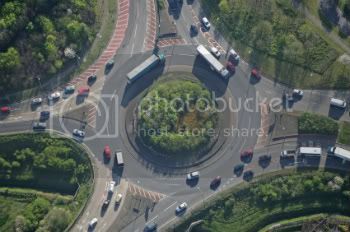 Traffic circles allow traffic to move through an intersection without the use of traffic lights. While the traffic is forced to slow down when entering the traffic circle, there are no long waits for traffic lights and traffic moves more smoothly. Traffic calming has been implemented in towns and cities throughout the US from West Palm Beach Florida to Seattle Washington but the measures are usually very expensive to implement and maintain. Traffic calming is most often seen on urban streets with lower speeds. Studies conducted to gauge their effect on highways with higher speeds have had mixed or limited results. Hans Monderman, a Dutch traffic engineer looked at some of the traffic calming procedures and felt they were ineffective. Monderman rejected the notion that wider roads and more warning signs created a safer environment. He was hired to look at a street in the Dutch village of Oudehaske, where speeding drivers had struck and killed two children. Instead of employing the typical traffic calming devices, Monderman removed the curbs, took out the signs, and used paving bricks that had the effect of making the road seem narrower. The effect was to create enough uncertainty in the minds of drivers that traffic immediately slowed down and the average speed was dramatically reduced. Without signs or lane markings, the effect changed driving behavior making drivers more accommodating and cooperative. In another town he replaced a collision prone, traffic light controlled four-way intersection with what he referred to as a "traffic square," with no signs or signals. The result was a striking reduction in the collision rate and more cooperation between drivers, pedestrians, and cyclists. He often demonstrated the effectiveness of this new intersection by safely walking backwards down the street with his eyes closed. Drivers on the road today may want to keep the Peltzman Effect in mind. Safer cars and wider roads don't necessarily make the driving environment safer and don't relieve the driver of the responsibility to maintain a safe speed and to pay attention to the road ahead. National Safety Commission Alerts work to increase awareness of important safety issues, particularly those that deal with highway and traffic safety information. Our mission is to make consumers more vigilant and understand that "safety is no accident," through education, including online traffic school, driver education and outreach programs.